Last August I had the privilege of another ESA assessment, this time they finally allowed me to have a home visit! It’s obviously not my first assessment, most of us have had many of these unsuitable time and money wasting exercises, on one visit a doctor (?) with a foreign accent actually seemed to understand and empathise. 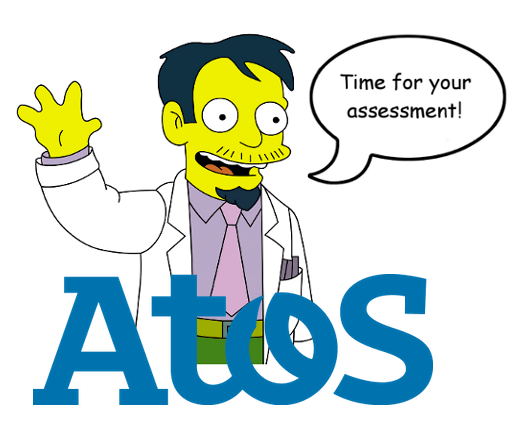 “I can see you are in a lot of pain, we will finish here and I will fill in the rest” he announced, I couldn’t believe it, finally someone from ATOS actually cares. “it’s okay” he said to my wife as we left, “leave it to me, he doesn’t need to put up with this, I will make sure he doesn’t have another assessment for a long while”, she was so happy to have that stress removed from our life. When the letter turned up the caring and understanding doctor had put N/A to the rest of the assessment questions and I had a total score of zero! I was told that I had to attend the job centre for meetings, luckily the guy at the job centre was amazing, he said not to attend anymore and ask for an appeal and that he was fed up of being sent people who were obviously very unwell. My next assessment letter arrived and we asked for a home visit but was told that it was not possible, my GP sent a letter that was not worth the paper it was written on and so we had to visit the assessment centre. This time the woman was obviously not interested, she was abrupt and almost robotic. “Can you get on the examination bed” she asked, I said I wouldn’t because I wasn’t willing to be pulled about because it would be painful, she stared at me in silence before shaking her head and taking her seat behind her screen of secretness. Once again the letter informed us that I had been awarded the grand total of zero points. Now I know these tests are causing problems across the country and many people are falling short on the points but I couldn’t believe I was not given a single point. I’m reliant on a wheelchair full-time, my pain levels are constantly high and maybe because of the meds, my brain is fried. So once again we appealed. Some months later a woman phoned about my appeal, she asked me some questions and then she asked if there was someone else she could talk to and so I passed the phone to my wife! I can talk nonsense all day long, however if I’m asked a question, my brain refuses to play! I could hear my wife telling her what meds I am on, she then smiled at me and mouthed “it’s okay, she’s so nice”. Apparently as soon as my wife had said I that I was prescribed Oramorph, the woman had said that because of that one thing, I had enough points and she would reverse the decision. We had endured months on less money and the stress and worry caused by a zero points award. So anyway, last August I had an ESA assessment, a home assessment and my insisted that we audio record the visit. The doctor turned up and went through his list of questions, he was sat on the end of the settee that I was laid on and at the end he asks if he can examine me and so I said no because of my pain levels. However he gets up and lifts my leg, “can you hold it there” he asks, I guess I should have asked him what the hell he was doing, examining someone without permission is basically a form of assault, but I didn’t say anything, I was just shocked. When he left my wife said “can you believe that”, I thought she meant the brief examination but no, she had recognised him as the first guy who had conned us by pretending to care! So we are now in February and we still haven’t had a letter to tell us the outcome of that assessment, I’m tempted to phone and ask but I’m worried that if they have forgotten about me, I might alert them to the error and that my award was point short again! I’m going to keep quiet, no contact sounds like bliss to me!